What do tall, gleaming skyscrapers have in common with rustic, handwoven textiles from Guatemala? Plenty, if you ask Dita Zakova of Ecolibri, a social enterprise based in the Lake Atitlan region, and Rhea Alexander, founder of sustainable design house DIGS. 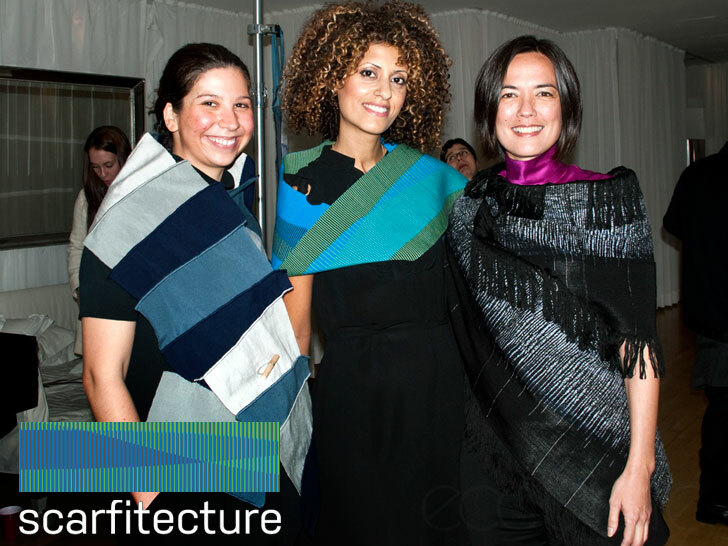 The duo launched Scarfitecture: A Venture in Design, Sustainability and Impact Investing earlier this year to build awareness of the skills and abilities of Guatemalan women artisans, who collaborated with seven internationally renowned architects to create a series of scarves and shawls using natural dyes and reclaimed yarn. The completed designs were featured in a fashion show in New York City's Financial District earlier this month, followed by a silent auction in benefit of Ecolibri's community-sustaining work. After recruiting Winka Dubbeldam, Galia Solomonoff, Anna Dyson, Chris Sharples, Dukho Yeon, Ali Soltani, and Juan Carlos Matiz, Alexander and Zakova asked each architect to submit a photo or painting that could be rendered into a woven textile. The weavers had to adapt their approaches, sometimes inventing new techniques. The 10-week project wasn’t without its challenges. Most of the designers, for instance, had never attempted their own textile pattern before. The weavers also had to adapt their approaches, sometimes inventing new techniques to accomplish the ideas they had in mind. The team members used Skype and email to review ideas, photos, and the progress of each design, although some of the architects also seized the opportunity to pay a visit in person. Each piece boasts its own inspiration and technique that distinguishes it structurally and contextually from the others. Dubbeldam of Archi-Tectonics created a design inspired by water and fishing, both of which are an integral part of life in the Lake Atitlan region, while Soltani of NYC firm Soltani + LeClerq took his cues from the shape of the land and Guatemala’s diversity and tolerance. Each piece boasts its own inspiration and technique that distinguishes it structurally and contextually from the others. For Dyson, photovoltaic panels served as the driving force behind her design. Working with her weaver, Dyson made a nanoscale image of gallium arsenide—a component in high-tech solar cells— appear like blue blades of grass. 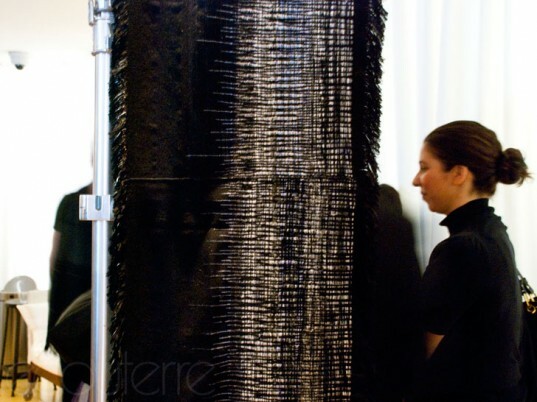 “The reproducing pattern is compelling for me as the most artificial materials at their core contain the same elements as ‘natural’ materials, except they are just sequenced differently,” she tells Ecouterre. Proceeds from the scarves will be reinvested in Ecolibri, which aims to improve the health, education, environment, economy, and independence of families in the Lake Atitlan region of Guatemala through the creation of a sustainable marketplace. Scarfitecture is an example of one such project, one that harnesses international efforts to create a sustainable business model that can be easily replicated. The 10-week project wasn't without its challenges. Most of the designers, for instance, had never attempted their own textile pattern before. The weavers also had to adapt their approaches, sometimes inventing new techniques to accomplish the ideas they had in mind. The team members used Skype and email to review ideas, photos, and the progress of each design, although some of the architects also seized the opportunity to visit the artisans in person. Inspired by the shape of the land and Guatemala's diversity and tolerance, Ali Soltani designed 22 pieces, joined by buttons, that the wearer can reassemble into different shapes and designs. Dukho Yeon created a design based on a facade drawing for I.Lab, Italcementi's new research and innovation center. The design won the European Green-Building Award 2010 from the European Commission. Inspired by photovoltaic panels and sustainability, architect Anna Dyson and weaver Sabina Perez Mendoza worked together to recreate a nanoscale image of gallium arsenide, a solar-cell constituent that resembles blades of grass up close. Chris Sharples worked with Ana Maria Mendoza Perez to produce a design inspired by a 1999 proposal for MoMA PS1's summer program. Juan Carlos Matiz and Sara Mosele Matiz of Matiz Architecture created their beautiful design despite damp weather that slowed drying time. Galia Solomonoff based her design on the segment of a roof plan for the Biblioteca Central in Argentina. Maria Mejila Martin's first prototype for Solomonoff's design did not work out because the cotton was too stiff. The fabric was rewoven with some rayon which solved the problem. Dutch architect Winka Dubbeldam of Archi-Tectonics created a design inspired by water and fishing, both of which are an integral part of life in the Lake Atitlan region. 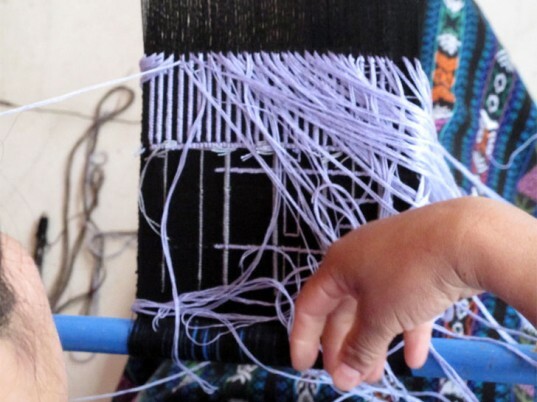 Dubbledam's design comprises naturally dyed cotton blended with Aleman and woven on a back-strap loom by Ecolibri artisan Isabela Pichilla Ramos. It was by far the most detailed of the works, taking over 44 days to complete the intricate embroidery.